No plants stands out more during the month of December than the Poinsettia. I never knew until discovering this particular photo that the Como Zoo Conservatory was home to so many Poinsettias during December having only made my first visit there this August. While this photo may seem bland to some, it appealed to me because it's different. I flipped back and forth between about a half-dozen photos in deciding on the best of December. There were serene snowfall photos, a stunningly well-lit tree wrapped in purple LED Christmas lights and a few other stark and decidedly wintry photos in the mix but the perfect symmetry of the conservatory and the subject matter (I've never seen so many poinsettias and I grew up a couple of miles from one of the largest greenhouse complexes in the state). So there you have it. The best photos of 2011 has come to a close. If I'm counting my fingers correctly I've done a best of the past year for four years -- each year since I launched this site (in July of 2008). Thanks again to the readers who have been with this site since its first day and thanks, too, to everyone who has told a friend or co-worker about MinnPics. I started this site because I love photography and the photographers I showcase here are far better at their craft than I am. Have a Merry Christmas and keep coming back! My parents were married there. I think they said their guest list was limited to 75 and they all had to stand through the ceremony. My younger brother proposed to his wife at the end as well (I got to take photos of it for him). 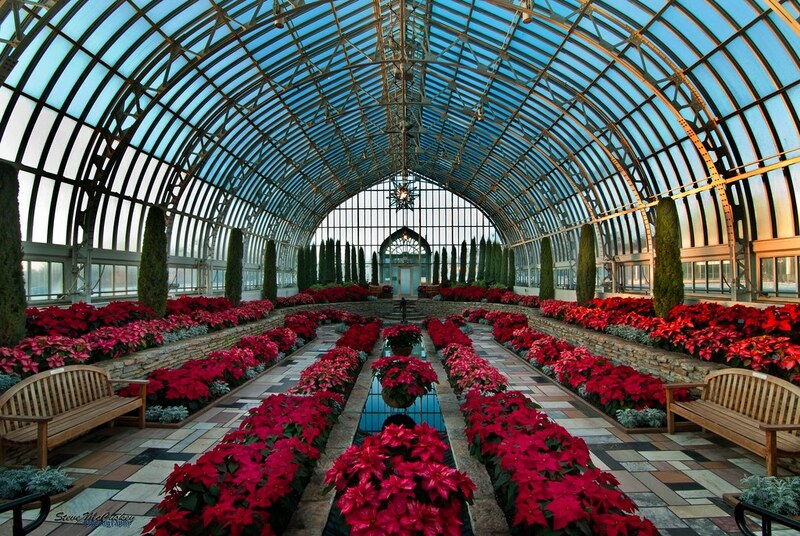 The conservatory is easily one of my favorite places in the Twin Cities, especially in the winter.